Why does this child with speech delay get an EEG? My first encounter with Landau-Kleffner-Syndrome and continuous spikes and waves during slow sleep (CSWS) was in medical school when my pediatric neurology attending faced me with this very question. I looked at him and basically had no idea. This is when I learned about the spectrum of rolandic epilepsies and how epilepsy interacts with speech. This concept is best explained by going back to the most common epilepsy in children, Benign Rolandic Epilepsy (BRE). And the genetics of BRE and the rolandic spectrum has been anything else but straightforward. Benign Rolandic Epilepsy. The rolandic region is the cortex next to the primary motor and primary sensory cortex and is particularly prone to producing hypersynchronous activity that can be recorded over the centroparietal region. These centrotemporal spikes (CTS) are the hallmark of a group of epilepsies that can be quite heterogeneous. The textbook description is a child that suddenly stands in the parents’ bedroom, looks extremely terrified, drools and cannot speak. In some cases, children have a palsy of one side of the body, which might even look like a stroke. Parents are on high alert and rush the child to the hospital. By the time they arrive in the ER, the symptoms are gone. The child receives an EEG on the next day where classical CTS can be seen. This hypothetical case report highlights the major aspects of rolandic epilepsies: they may affect speech, often occur at night and have a particular EEG signature. Rolandic Epilepsy and twins. Rolandic Epilepsies are self-limiting epilepsies in the majority of cases and the MRI is typically normal. In the genomic era, this suggests that genetic factors could be at play. This is the case with other formerly called “idiopathic” epilepsies including Childhood Absence Epilepsy or Juvenile Myoclonic Epilepsies. In these diseases, twins tell a very clear story: identical twins are almost always concordant, i.e. both twins are affected in contrast to non-identical twins. However, in BRE the story is entirely different. There is not a single identical twin pair reported to date where both twins have typical rolandic epilepsy. They simply don’t exist. What twins have in common, however, is the EEG pattern of CTS. On the basis of the familial clustering of CTS, family linkage studies have been performed and these families are also studied within the EuroEPINOMICS CoGIE project. Some candidate genes such as ELP4 for CTS have been suggested. Epilepsy without seizures – LKS and CSWS. The EEG pattern of CTS is particularly frequent in sleep and can be so frequent that it completely predominates slow-wave sleep. In this case, children have an electrical status epilepticus in sleep. Interestingly, these children often do not have seizures. The term continuous spikes and waves during slow sleep (CSWS) refers to this condition. This status epilepticus, i.e. continuous seizure activity takes its toll on the brain region that is affected the most – the rolandic region, which is important for speech and speech perception. When children are affected to that extent that they loose speech and have difficulties perceiving sounds (“auditory agnosia”), this combination has been described as Landau-Kleffner-Syndrome (LKS). In contrast to “benign” rolandic epilepsy, CSWS and LKS are extremely difficult to treat and are the reason why my attending during medical school wanted to have an EEG done on this particular child (while there is no debate that children with language loss or deterioration should get an EEG, there is actually an ongoing discussion whether this should also be offered to children with primary speech delay, i.e. speech problems from the beginning). CSWS and LKS can be due to lesions or developmental malformations in the rolandic area, but also due to genetic factors. The genetics of LKS and CSWS. As one of the first genetic findings in the spectrum of benign to severe rolandic epilepsies, SRPX2 was identified in 2006. While the function of SRPX2 as an secreted protein is still unknown and completely unrelated to other pathogenic principles seen in genetic epilepsies, some interaction with the plasminogen activator receptor uPAR has been shown. More recently, the role of copy number variations in CSWS was suggested. In a recent study in Epilepsia, Lesca and collaborators screened a cohort of 61 patients with CSWS and LKS for copy number variations. CNVs in LKS and CSWS. 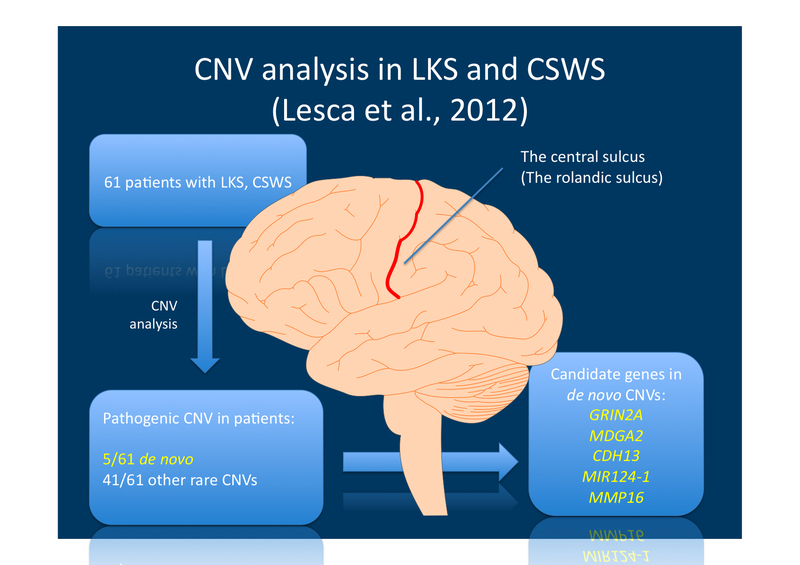 Lesca and collaborators identify 5/61 (8%) pathogenic de novo CNVs in patients with LKS/CSWS and a large number of previously not identified CNVs that were either inherited or not tested. The frequency of roughly 10% is in line with initial studies on autism, but in comparison to more recent estimated in other neurodevelopmental disorders might be an overestimate. Many genes involved in these de novo CNVs and inherited CNVs have previously been reported in autism studies, which leads the authors to postulate that “genomic dissection makes the link with autism”. While it is left to the reader to interpret what genomic dissection actually refers to, some overlap with genes found in autism is surprising. However, some of the genes proposed by the authors might not be as pathogenic as suggested. 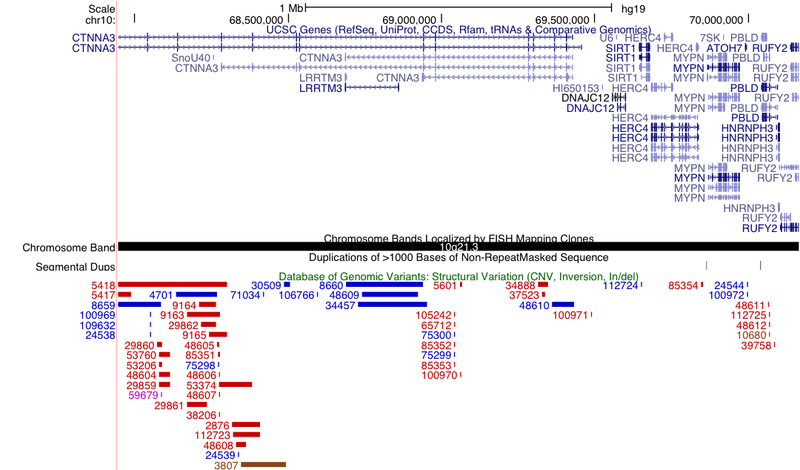 For example, while intronic and exonic CNVs identified in CTNNA3 are unique and not previously described, other gene-disrupting CNVs can be found in this gene in the Toronto Database of Genomic Variants. Accordingly, this gene is very unlikely to contribute to disease. A similar case holds for other genes identified by the authors, reducing the frequency of 74% of patients with allegedly pathogenic variants to a probably much a smaller number. Candidate genes in LKS/CSWS. Despite these issues, the confirmed de novo CNVs provide an interesting glimpse into the genetic architecture of LKS/CSWS. One patient was identified with a partial deletion of GRIN2A. GRIN2A, coding for and N-methyl-D-aspartate (NMDA) receptors had previously been identified in rolandiform epilepsies, as well. In addition, deletions in MDGA2 identified in one patient have previously been found in patients with autism. This provides an additional hint that some genetic risk factors including recurrent microdeletions might predispose to a broad variety of neurodevelopmental disorders. Implications for EuroEPINOMICS. The EuroEPINOMICS-RES consortium has initiated a LKS/CSWS working group and CNV analysis in addition to trio exome sequencing will be performed. Given the initial data from Lesca and colleagues, these investigation might help discover genetic risk factors in a significant fraction of patients with LKS/CSWS, helping us understand these perplexing disorders. This entry was posted in 2012, Epileptic encephalopathy, EuroEPINOMICS, Papers and tagged CNV, copy number variation, CSWS, genetic architecture, GRIN2A, Landau-Kleffner, microdeletion, SRPX2. Bookmark the permalink.